Ed. Note: I've come to the conclusion that each of Rich Harden's starts down the stretch are going to be crucial. So after each start, I'll provide the line for Richard James Harden until the season ends or his arm falls off. Whichever comes first. Harden vs. Houston 8/05 (ND, 1-1) 5.2 IP 8 hits 5 runs 4 earned runs 2 home runs 1 walk 8 strikeouts. So, the Cubs bat awaken to help Harden and in return he has his worst outing in Cubbie Blue. Still, he helps your fantasy team with eight punchouts. 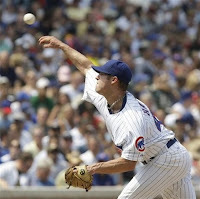 That brings Harden to a 1-1 record 2.10 ERA 47 strikeouts 9 walks and a 1.03 WHIP in 30 innings pitched as a Chicago Cub.